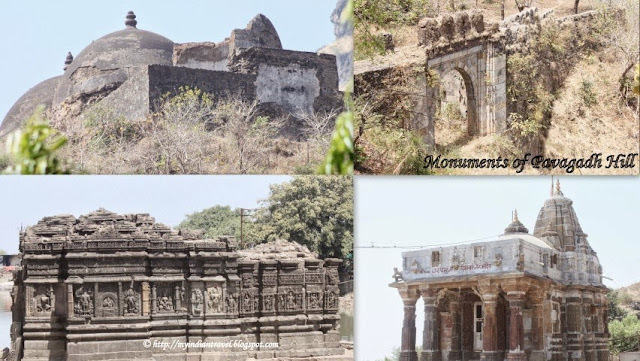 Pavagadh is part of UNESCO World Heritage Site Champaner - Pavagadh Archelogical Park. This place which is just 45 kms from Vadodara is a must visit not only for pilgrims, but also for tourists. The Pavagadh Hill rises to 830 m and descends in five successive plateaus which are separated by steep cliffs namely Kalikamata, Mauliya, Bhadrakali, Machi and Atak. The higher plateaus on the west and south makes it safe and inaccessible from invasion. One can choose to reach the top of the hill either taking the steps to the the top or rope-way. If one takes the steps and walk all the way up to the top of the hill from Machi and it takes approximately 3 hours. We choose to use the rope-way to reach top of the hill from the base station at Machi. It took just 6 minutes to reach the top. Hello Rajesh, the first shot is lovely, a beautiful view! That is a lot of steps, the rope way sounds much easier.. Great post and photos.. Enjoy your day! These cable cars are sure way to get you into adventure. Thanks for sharing. Wow! Your kids are braver than I am...I don't think I'd take a ride up there! What a site. You have a lot of world heritage sites, right? Hmmm … three hours or six minutes. I would go for the spectacular six-minute ride but the three-hour-trek would give an in depth and entirely new perspective I would imagine. Beautiful shares in these photos! You have been busy snapping lots of great photos! Thank you and enjoy your week! What a wonderful and historic place, Rajesh!! Terrific shots for the day as always! Hope you have a great new week!! Yes, this place is very interesting, I like the photos!! What a beautiful place - I'd take the gondola too! Looks like a fascinating place to visit and I'll bet the ride is fun! Taking the steps looks like a very steep and hard climb! I think the rope way is what I'd chose. Are those your sons? They are getting so big! What lovely scenery and adorable kids. Looks like a fascinating place to visit. I'm pretty sure if I were ever to travel there I too would need to take the rope way. Have a great week Rajesh. That would be quite the work out! Whew. Very interesting place to visit and first time learning about it! It must be exciting taking the ropeways or cable car. important to keep green space. Looks like there's plenty to see here. Haven't heard of it before. Our country has so much history that we're not even aware of.